NETWORK UPDATE: The reruns of THE MIDDLE and the IHEARTRADIO JINGLE BALL lost 0.1 in final numbers, as did the 8PM SVU rerun. CABLE HIGHLIGHTS: ESPN’s COLLEGE FOOTBALL bowl games had 4 of cable’s Top 6 cable slots at 1.49 (Texas A&M vs Louisville)/1.29 (USC vs. Wisconsin)/0.92 (North Carolina State vs. Mississippi State)/0.63 (Auburn vs. Memphis). Discovery’s ALASKAN BUSH PEOPLE was at 1.13, and with that lead-in, MEN WOMEN WILD rebounded by two-tenths from last week to 0.42. 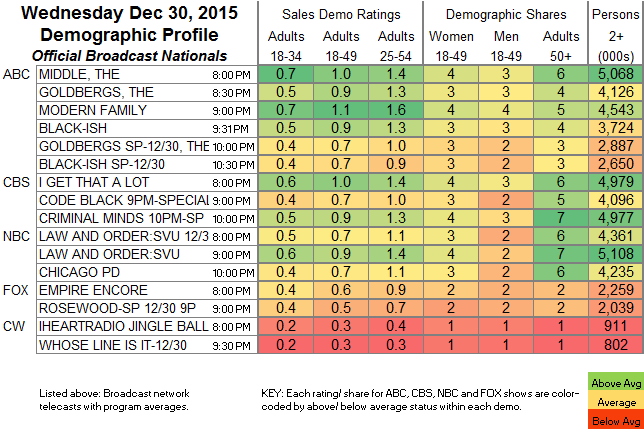 On HGTV, HOUSE HUNTERS and HOUSE HUNTERS INTL were both at 0.48. 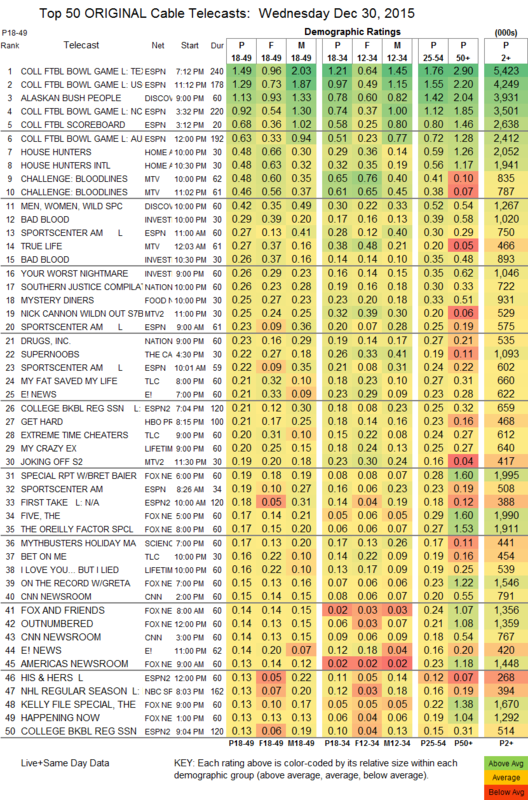 MTV aired 2 episodes of THE CHALLENGE at 0.48/0.46, compared to last week’s 0.38, and a midnight TRUE LIFE was at 0.27. Meanwhile, MTV2 had NICK CANNON WILD N OUT at 0.25, with lead-out JOKING OFF at 0.19. TLC, which certainly works on its titles, scored 0.21 for MY FAT SAVED MY LIFE, f0llowed by 0.20 for EXTREME TIME CHEATERS. On Lifetime, MY CRAZY EX was at 0.20, and I LOVE YOU… BUT I LIED was at 0.16.